San Francisco 49ers players, ownership, executives and staff teamed up with Cabrillo Middle School students and educators, Chevron executives, representatives from the Silicon Valley Education Foundation and members of the Santa Clara Unified School District School Board on Monday, September 28, to paint a mural on an exterior wall of the Chevron STEMZONE at Cabrillo Middle School in Santa Clara, Calif. 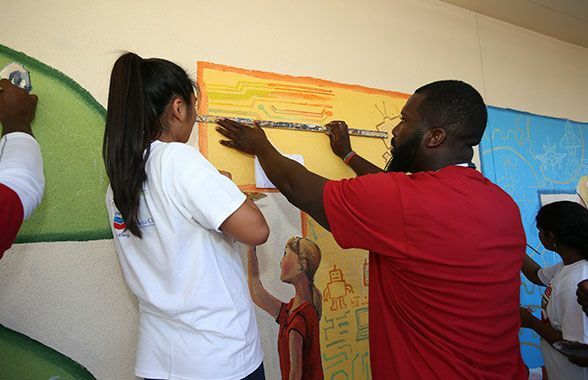 The goal of the mural painting celebrated the organization’s commitment to Science, Technology, Engineering, and Mathematics (STEM) education, while memorializing current and future students that will learn at the Chevron STEMZONE. 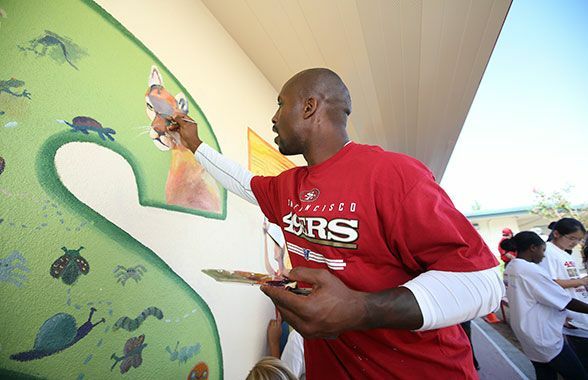 To show their support of STEM education, TE Vernon Davis, DT Quinton Dial, TE Garrett Celek, G Brandon Thomas, DL Glenn Dorsey, TE Vance McDonald, P Bradley Pinionand WR Torrey Smithpicked up their paintbrushes and got to work, contributing to the mural. 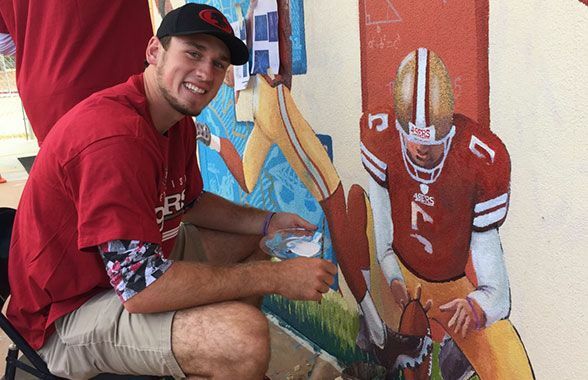 Commissioned by the 49ers, the mural was designed by Bay Area local artist Morgan Bricca of Morgan Art Studios. 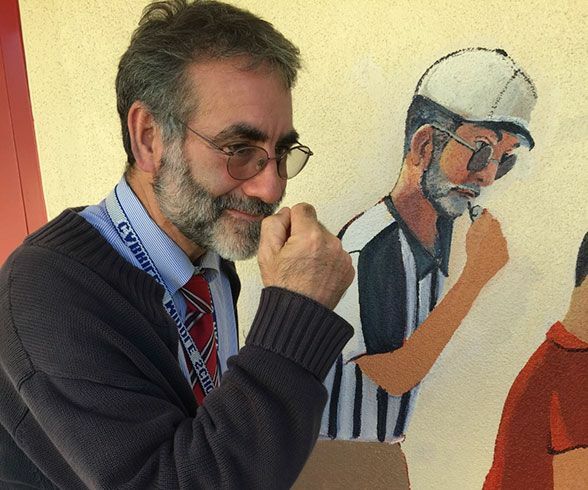 The mural focuses on visual representations of Science, Technology, Engineering and Math and how it relates to the game of football. 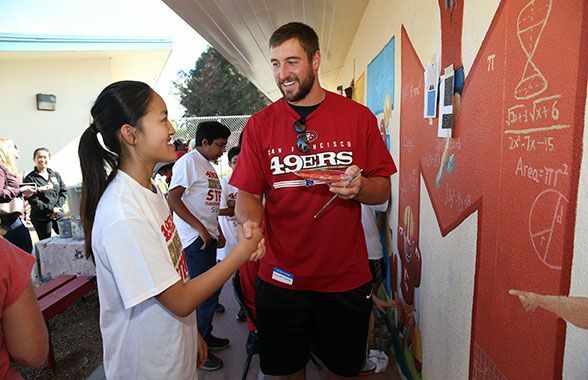 The 49ers STEM Leadership Institute is a six-year curriculum that begins in seventh grade and will continue through high school, seeking to prepare students with high academic potential to be outstanding in STEM. The goal of the Institute is to inspire and enable young scholars to pursue STEM-related majors at top-tier universities and to later enter into STEM-related careers. Launched in 2014 in partnership with the 49ers, Chevron, the Silicon Valley Education Foundation, and the Santa Clara Unified School District, two cohorts of scholars totaling 120 students are currently enrolled in the 7th and 8th grade program. Currently under construction and scheduled to open its doors in 2016, Santa Clara High School will welcome the Class of 2020 to the FabLab designed Chevron STEMZONE. The FabLab will also be a resource for all science students on the campus and, during non-school hours, will serve entrepreneurial community members in need of a state-of-the-art design studio. The STEM Leadership Institute’s rigorous academic courses along with practical lab experiences seeks to produce a pipeline of talent for Silicon Valley’s future workforce.